Bryn Tudur is located at the edge of the Snowdonia National Park, North Wales, about 2 miles from the walled town of Conwy, and 10 minutes drive from the Victorian coastal resort of Llandudno. This is a working farm where you are welcome to meet the animals. 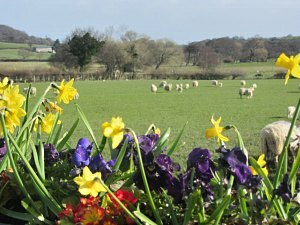 The holiday cottage and static caravan are situated on a working farm in the Conwy Valley, 2 miles from Conwy at the edge of the Snowdonia National Park. On the farm there are sheep, cows, hens, ducks, dogs and a cat. Children are welcome to feed the animals, play in the fields and have a taste of farm life.. This is an ideal location for enjoying the peace of the countryside, cycling, walking and exploring the Conwy Valley and Snowdonia. 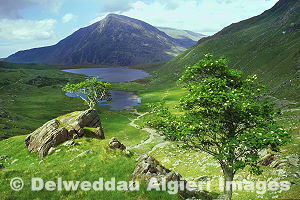 Enjoy a high level walks in the peaks of Snowdonia, or a low level walk in one of the local valleys or forests. There are mountain bike routes locally at the Marin Trail and Penmachno Trail. Fishing, golf and birdwatching are also well catered for. The RSPB bird reserve at Conwy is nearby. 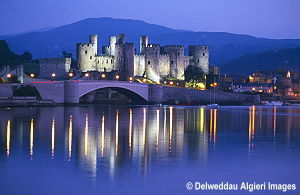 There are local castles to explore including Conwy, Dolwyddelan and Caernarfon Castles. Conwy Castle is just 2 miles away, and is the dominant feature in the medieval walled town. Wales is famous for its steam railways. 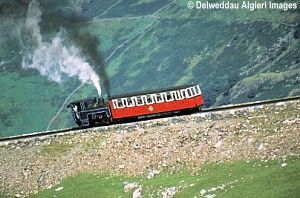 The main ones in the area being the Ffestiniog Railway, Snowdon Mountain Railway, and the Welsh Highland Railway. There are numerous other tourist attractions in this part of North Wales that you can visit during your stay. See the attractions map above for more information about local attractions. The seaside of the North Wales coast is just a few miles away. 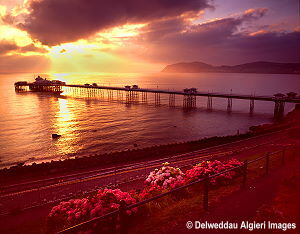 The victorian seaside resort of Llandudno is just 10 minutes drive from the cottage and caravan, and is well worth a visit with its long promenade and beach, and interesting shops. The beaches of Anglesey and the Lleyn Peninsula are also within easy reach. There are plenty of places where you can eat out, including local village pubs, and a good selection of cafes, restaurants and bistros in Conwy. To help you plan your journey, and see where the holiday cottage and caravan are located, see the Find Us page for location map and route planner.